Two-time defending Indy Car Series champion Panther Racing entered the 2003 season amidst a dominant run in the league. After winning the title in 2001, many league insiders believed that Panther would have little chance the following year when Team Penske joined the Indy Racing League full-time, but it was Hornish and Panther that took home the season-ending championship yet again – this time in dramatic fashion as Hornish edged out Helio Castroneves in a thrilling season-finale at Texas Motor Speedway that was instantly considered the league’s greatest race. 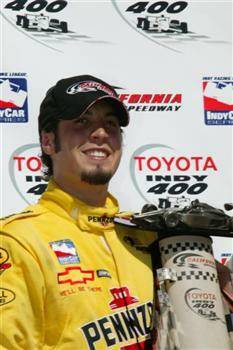 It would be a slow start in 2003, but a late-season charge kept Panther, Hornish, and that feisty yellow No. 4 car at the front of the pack. 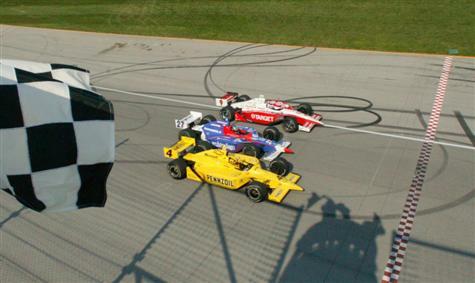 While Panther had come out on top with its battle with Penske in 2002, earning a third consecutive title would get even harder as more defectors from the CART series – Andretti Green Racing, Chip Ganassi Racing and Rahal Letterman Racing – would make the championship battle an even more difficult hill to climb. But, as the team soon discovered during its pre-season testing, it wasn’t the new teams that would cause Panther the most trouble. Instead, it was the addition of new engine manufacturers Honda and Toyota that would put Panther at a severe horsepower disadvantage – one that, in the end, likely cost them a third IndyCar Series title. New championship hopes would arise, however, as Panther announced it would enter a car in the new developmental Indy Pro Series with Englishman Mark Taylor. The car, quite appropriately, would be a yellow No. 4 with Fulmar sponsorship – a London-based printing company. Taylor, who was a likeable developing driver from Formula 3 and Formula Fords, would follow in the footsteps of Hornish by winning each of his first two races with the team – at Homestead and Phoenix, setting a standard that where ever there was a yellow No. 4 car, there would be a Panther team in victory lane. 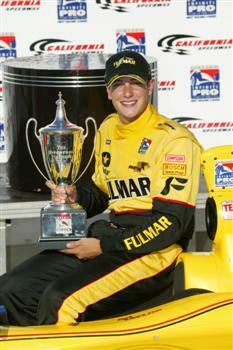 But for the Pennzoil crew and Hornish, the first part of the 2003 season wasn’t bringing as much celebration. By the time the team reached the Indianapolis Motor Speedway in May, they had little to show for the first three races of the season aside from one sixth place finish and two-months worth of frustration. With the Speedway’s daunting 2.5-mile oval staring them in the face, and a horsepower disadvantage keeping them out of contention, hopes for the team’s first Indy 500 victory that May were not very high. Hornish wouldn’t win the Indianapolis 500, but despite his disadvantage, the Defiance, Ohio native was running – remarkably - in the Top Five with just under six laps remaining in the race when his engine finally let go, and the subsequent cloud of smoke was greeted with a collective groan from the 400,000 fans in the stands, millions watching on TV and the 20-something crewman huddled in pit lane. It was an admirable fight that came up short. Taylor and his IPS team didn’t stop either, and the London-born driver continued to dominate the Pro Series unlike anybody had seen before. After his two debut wins, Taylor would capture races at Kansas, Nashville and Michigan as his victory total climbed nearly as quickly as his points lead. With the season slipping away and speculation that Hornish was heading to NASCAR when his contract expired at season’s end, Chevrolet came to the rescue. As the season slipped past its half-way point, Chevy introduced its Gen IV engine, one that would quickly – and happily – replace the Generation III motor that wasn’t keeping up with the Hondas and Toyotas. And it took just one race, at Michigan, for the league to recognize that the boys were back in town. Hornish would finish second in his first race with the Gen IV motor, losing by a nose in a duel with Alex Barron in his own version of the “spin & win”, but Chevrolet’s new engine would help Panther storm back into the championship chase, and – a few weeks later – back into victory lane. Starting in Kentucky, the team’s first pole position of the year quickly turned into its first victory – in a race where Hornish would lap every car in the field except second-place finisher Scott Dixon. The celebration at Panther’s offices was short, as Hornish informed the team the following Monday that he would not return to the team for the 2004 season. He didn’t, at the time, disclose where he would be running the next year, but shortly thereafter it would announced that Sam was following his boyhood dream to drive for Roger Penske in the IndyCar Series. While the reaction was mixed at the Panther headquarters, few could fault Hornish for realizing a dream he’d had since boyhood. But it was hard to think of anybody being able to break Panther’s dominance at the time. And, even Roger Penske admitted later that Panther and Hornish had beat his team “like a drum”, but the reality sunk in that the Hornish-era at Panther was coming to a close. A week later, it was another double dip for Panther – with Taylor winning another IPS race and Hornish putting on, yet another, dominant performance at California Speedway where he captured the win and set the new record for the fastest closed-course speed record with an average speed of 207.151 mph. It would be the last of his 11 victories with Panther. The team’s late-season storm put them in championship contention at the final race of the year at Texas, but unlike the storybook ending of 2002, a mechanical issue would leave Panther and Hornish with a fifth place finish in the final championship standings. It wasn’t the ending they had planned, but the mark on open-wheel history had been made. Panther, a team started by an assortment of life-long race fans, had become the winningest team in IndyCar Series history and captured coveted back-to-back championships and Hornish, the little-known driver that nobody wanted from Defiance, Ohio became one of the best racecar drivers on the planet piloting the team’s yellow No. 4 car. There would be different roads ahead for both driver and team, but the two would be forever partnered in a historic three-year run that encompassed some of the most thrilling moments in the history of open-wheel racing. John Barnes, who hand-picked Hornish when it looked like the Ohio native had no other options, refused to completely close the book on the partnership.